RIO DE JANEIRO, BRAZIL – “Changing the world one trash bag at a time” is the slogan that best describes the work of Amigos do Mar. The group, which has been cleaning up Rio beaches since 2017, is leading a another beach cleanup this Saturday, April 13th, alongside local NGO Mais Caminhos. This time, they are focusing their efforts on beautiful, but lesser-known Praia da Bica, in Ilha do Governador, and are looking for volunteers to join them. 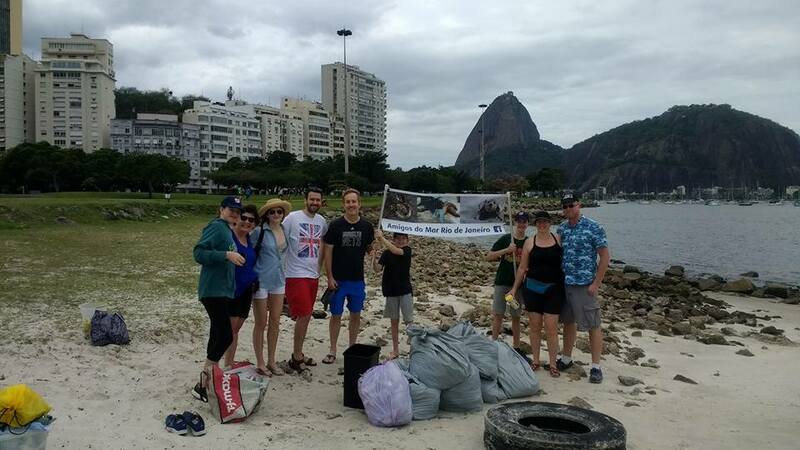 Amigos do Mar Rio de Janeiro have been cleaning up the city’s beaches since 2017, photo courtesy of Amigos do Mar Rio de Janeiro. “We’ll be picking up trash for three to four hours at Praia da Bica and surrounding areas,” he says. The reason for choosing Praia da Bica, and not, say, Copacabana, is that Bica tends to receive less attention from the city authorities than the more famous, touristy beaches. “Ipanema and Copacabana receive more regular maintenance, whereas beaches that are along the coast of Guanabara Bay don’t get as much attention from the federal or the municipal governments,” Avitabile explains. The group will meet in front of the Caminhos Language Centre early Saturday, and a carpool will be organized to take volunteers to the beach. Volunteers are encouraged to bring gloves, trash bags, water, and money for transportation. Previous articleOpinion: We Know it Rains in Rio. Why Was the City so Unprepared?